Nestled among the Andes Mountains in South America sits Cusco, one of Peru's most famous cities, also often spelled Cuzco, Cusco is the seventh most populous city in Peru and is the capital of the Cusco Region and Province, located in the southern section of the country. Cusco covers an area of 148.7 square miles and has a population of approximately 430,000 people. Cusco has the distinct honor of being a UNESCO World Heritage Site since 1983 and is well-known for its fascinating history, architectural heritage, and famous museums. The city of Cusco has a lot of history behind it. The area was inhabited by the Kilike people from 900 to 1200 AD; during that period, they built Saksaywaman, the famous walled complex all around the city. After that, the Incan Empire arrived in the area and the city of Cusco actually became the Empire's capital and was a vitally important place to Incan people. The Spanish invasion then occurred in the 16th century, and Spanish explorers were very impressed by the architecture and structure of the city. They preserved much of it, while also building their own Catholic churches and transforming some of the larger buildings into mansions. 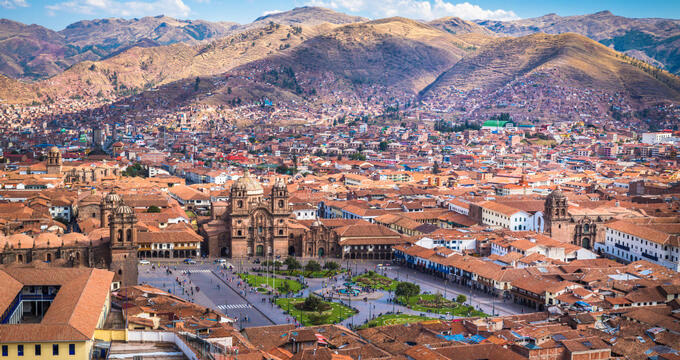 A tragic earthquake in 1950 destroyed over 30% of the city's buildings, but renovation and restoration helped to fix some of the damage and the city of Cusco has become a hugely popular touristic destination over the years. It's the number one touristic city in all of Peru brings in several billion dollars to the country's economy each and every year. Some of the most popular sights include Saksaywaman, an old palace built by the Incas called Qurikancha, and a famous cathedral built by the Spanish called the Cathedral Basilica of the Assumption of the Virgin. One of the most visited man-made wonders of the world, Machu Picchu, can also be reached by foot from Cusco. The elevation of a city or town tells us how high it is above or below sea level. Cusco has an elevation of 11,152 feet (3,399 m), which is higher than many mountains and higher than any city in the United States. The extremely high elevation of Cusco is due to its location among the Andes Mountains, and the city's height can actually trigger altitude sickness in some visitors. Altitude sickness generally begins to occur at elevations above 8,000 feet (2,500 m). The air is thinner and colder at these elevations, so people may need some time to get used to the conditions when visiting Cusco and this is an important aspect to consider when planning a trip to Cusco. The highest point in all of Peru is the Huascarán mountain, located in the province of Yungay and having an elevation of 22,205 feet (6,768 m), while the lowest point in the country is an area called the Bayóvar Depression, located in the Sechura Desert, and this location has an elevation of 112 feet (34 m) below sea level. Many of the major tourist destinations and cities in Peru have very high elevations. The Nevado Huascarán Mountain, for example, has an elevation of 22,132 feet (6,746 m) and the Inca Trail, at its highest point, has an elevation of 13,780 feet (4,200 m). Machu Picchu has an elevation of 7,927 feet (2,430 m), so it's not quite as high as Cusco. The three most populous cities in Peru are Lima, Arequipa, and Trujillo. Lima has an elevation ranging from as low as 0 feet (0 m) to as high as 5,090 feet (1,550 m), Arequipa has an elevation of 7,661 feet (2,335 m), and Trujillo has an elevation of just 112 feet (34 m). So, when compared to the biggest cities around the nation, Cusco has a higher elevation in general. The city of Cusco has a subtropical highland climate, meaning it has two major seasons. The dry and sunny season runs from May through to the end of August, with relatively high temperatures in the days that can drop very low in the nights. Then, from late November through to March, the wet season begins with a huge amount of rainfall and quite high humidity ratings. Cusco is also the spot on the Earth with the highest amount of ultraviolet light exposure on average. As previously mentioned, there are plenty of things to do in Cusco as it’s the most popular tourist hotspot in all of Peru. Many old buildings from centuries ago are still standing and can be explored and photographed. Incan, Kilike, and Spanish architecture can be found around the city, with Machu Picchu just nearby as well.